Welcome to Old Town Key West and Mango Tree Inn-Tropical and Charming Key West Accommodations Built in 1858, Mango Tree Inn is a true example of a Key West Bahamian style mansion. This architectural gem, featuring Dade County pine (now extinct) floors and walls, crown moldings, and unique octagonal wing, sits under a wild orchid tree on Southard Street, just one block from Duval in Key West Old Town. Upper and lower porches under a tin roof overlook a large heated pool and garden deck. We are not a typical Key West bed and breakfast accommodation inn, we live here and treat you as we do our friends who visit Key West. Please click here to go to our new Weddings Pages to see examples of Mango Tree Inn's Garden Weddings. Call to reserve your own wedding in Paradise! "Last minute rooms available--great July, August and September discounts for two night or more stays! 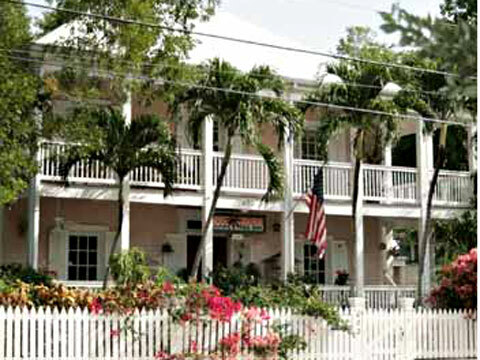 Starting @ $129 per night, grab a few days of Key West at beautiful Mango Tree Inn. Email or call for details." Key West Mango Tree Inn While relaxing in our spacious tropically decorated rooms, you can decide what to do in the Conch Republic (aka Key West or Margaritaville) - go diving, snorkel, take a sunset cruise, shop in the fabulous boutiques and galleries, ride the Conch Train, parasailing fly fishing or just walk around. We provide concierge help at no charge and will happily make reservations for all of your excursions. At the Mango Tree Inn, you are close to everything Old Town Key West has to offer! No vehicle is necessary. Fine dining is nearby with one of the best breakfast places, Sarabeth's, directly across the street, and if you're looking for a party atmosphere, a few steps and you're on Duval, where the fun never stops! Call Peggy now, TOLL FREE, at 877-90Mango (1-877-906-2646) or email below and you can soon be enjoying tropical breezes and sipping MangotreetasÂ® and MangotreenisÂ® in Paradise Key West Inn Pool SuiteAll our inn's rooms feature the comforts of home - air conditioning, ceiling fans, cable TV, hair dryers, free coffee in the room, unlimited free local calls. Some rooms offer kitchens. Our island decor will make you feel you as if you just landed in the tropics. After all, you are in Key West, the southernmost point in the United States! The tropical island you can drive to. While staying with us, be sure to chat with Jade, our beautiful parrot, and Leilani, our gorgeous cockatoo.Key West Jade a parrot friend If you are looking for small tropical inns, historically elegant, yet charming, visit us soon at Mango Tree Inn, in the heart of Key West Old Town. You will love our convenient location within walking distance of all attractions.